Whether you visit Minnesota’s North Shore or the beautiful Lake Superior, there’s no doubt about it, Minnesotans love to spend time on the water. Minnesota’s lakes and their shores provide many recreational activities and draw millions of boaters each year. With summer boating season approaches its peak, one thing is certain – Minnesota is serious about addressing Aquatic Invasive Species issues… Cool! With 15,000 lakes, thousands of miles of rivers and streams, and acres of wetlands to protect, Minnesotans recognize the importance of acting to prevent and slow the spread of the state’s current and potential aquatic invasive species, so that everyone can continue to enjoy these natural treasures. The Minnesota Department of Natural Resources (DNR) reminds everyone, when boating in Minnesota, protect our waters by following state aquatic invasive species laws to ensure compliance and avoid a citation. Most boaters are aware of the new law, which took effect 3 years ago and was intended to reduce the spread of invasive species like zebra mussels, watermilfoil and spiny water fleas. But this year Minnesota authorities will be cracking down on boaters who carelessly or unwittingly spread unwanted hitchhikers such as zebra mussels, Eurasian watermilfoil and spiny water fleas across the Land of 10,000 Lakes. Warnings have ‘come to an end! The Invasive Species Gestapo will be out in full force this summer. This by far will be the greatest and most thorough effort the DNR has put into publicizing what people need to do to be compliant.Violators are more likely to be ticketed than ever before, and fines are about to double. The DNR urges all boaters to follow the law and make sure they are not moving invasive species from one lake to another. Aquatic invaders cannot swim across the land, but if you give them a lift they can travel for miles. Boaters and anglers need to be accountable and take personal responsibility to prevent the further spread of invasive species. Our lakes and rivers are too important to take for granted. 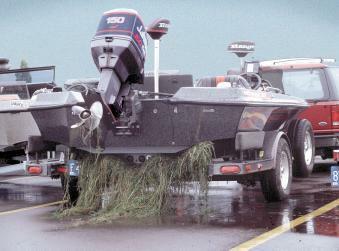 Boats can transport invasive species into new locations. Watercraft operators should follow the Clean, Drain, Dry strategy in between every body of water, each and every time! Aquatic, as well as many non-aquatic, invasive species are readily spread by flowing water. In addition, many aquatic invasive species are capable of survival out of water for extended periods of time. To prevent the accidental introduction organisms transported through water, all watercraft and equipment that are to be placed in a water body should be cleaned to remove invasive species, including any fragments, seeds, or other materials. When done properly before entering a new body of water, this general set of procedures can effectively prevent the spread of invasive species into new waters. Follow factory guidelines for eliminating water from engines. Always drain the bilges of the boat by removing the drain plug. Bilge pumps are not capable of removing all water from the boat hull. Drain live-wells, bilge, ballast tanks, and transom wells. Remove any visible plant or plant fragments, as well as mud or other debris. Plant material, mud, and other debris routinely contain other organisms that may be an invasive species. Check trailer, including axle and wheel areas, in and around the boat itself: anchor, props and jet engines, ropes, boat bumpers, paddles. Clean all parts and equipment that came in contact with water using one or more of the methods listed below. Allow everything to completely dry before launching into new waters; five days in warm, dry weather and up to 30 days in cool, moist weather. If sufficient drying time is not available, decontaminate all surfaces using one or more of the cleaning methods described below. Carefully inspect for invasive organisms before entering a new water body. Protect Your Boat From Aquatic Invasive Species! 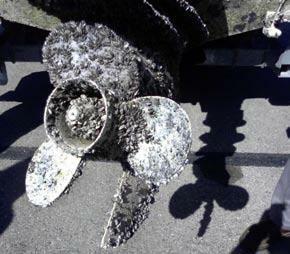 The longer a boat remains in zebra mussel-infested waters, the more apt it is to be fouled by zebra mussels. Therefore, boats that are docked or moored are more likely to be fouled by mussels than boats that are launched and retrieved in a single day. 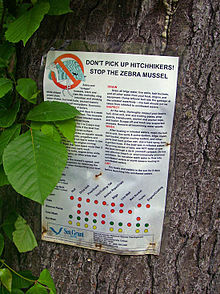 Quagga/Zebra mussels could severely reduce recreational boating and fishing activities if more waters become infested. • Reproduce quickly and in very large numbers, up to 1 million larvae per spawning sea­son. • Colonize on both hard and soft surfaces, from the water’s surface to more than 400 feet down, including boat hulls, propellers, anchors, docks, and boat trailers. • Coat submerged surfaces such as piers, pilings, rocks, cables, boat ramps, docks, lines, pipes and fish screens, increasing maintenance costs. • Infiltrate and damage boat engines, bilges, live wells, and steering components. • Threaten the state’s water treatment plants, hydroelectric plants, and reservoirs. • Clog municipal water intake structures and obstruct the flow of drinking water. • Cost taxpayers millions of dollars to repair damaged pipes and water transport facilities. • Wreak havoc on the environment by disrupting the food chain by filtering the water column of phytoplankton and out-competing other species, including sport fish and endangered species. • Change water conditions, causing heavier aquatic plant growth, oxygen loss, and fish kills. • Result in infested waters being closed to boating and fishing altogether. Once Quagga/Zebra mussels are established, in most cases it is impossible to eradicate them with current technologies. 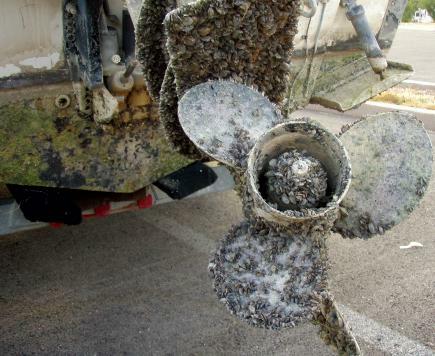 How do Quagga/Zebra mussels ruin boats? Quagga/Zebra mussels produce larvae (called veligers) too small to see with the naked eye. Newly settled young feel like sandpaper on smooth surfaces. As they quickly grow larger, Quagga/Zebra can be seen on boat hulls, especially around trim tabs and transducers along keels, and on trailers, anchors, and propellers. The mussels can also be found in or on boat bilges, ballast water, live wells, motors, fenders, life jackets, ropes – basically anything that comes into contact with infested water and can serve as a reservoir or “pocket” in which they can survive. Ruin your engine by blocking the cooling system and causing overheating. Increase drag on the bottom of your boat, reducing speed, and wasting fuel. Jam your boat’s steering equipment. Require you to scrape and repaint your boat’s hull. The sparkling, sky-blue waters of Minnesota lakes and rivers are a great source of pride for us all. They provide much of the recreational opportunity for which our state is famous. Please do your part to ensure that our legacy of healthy waters continues for generations to come.